In August, something very exciting occurred for parents in High Wycombe. The opening of a brand new 'play cafe' in the town centre - Lilymae's. Firstly, don't confuse a play cafe with 'soft play'. There are no large pieces of padded equipment, everything being on a much smaller scale. When you enter Lilymae's it appears to be much the same as any other cafe - a bright and airy space with a kitchen and counter area to one side. There is, however, a small area safely cordoned off for small babies and an abundance of books and colouring for bigger kids. Upstairs there is a bigger play space, an activity table and a sofa in addition to more tables for seating. Secondly, you need to be aware that this is not the finished product. Lilymaes is currently a trial project supported by HWBIDCo and stationed in the Enterprise HQ building. If successful, then the owners, Ricky and Roxi, will hopefully extend the lease or find another premises in which to continue. However, even the temporary set-up there is great. On their website, Lilymae's describe themselves as being a 'combination of a safe play area' and a 'town centre cafe' and the menu offers you the usual range of hot drinks alongside a decent selection of sandwiches, snacks and cakes which are all prepared by the chef. I can recommend the cupcakes - a great selection of flavours prepared on site that go down well with both kids and adults. What sets this cafe apart for me is the staff. It has a lovely atmosphere and friendly employees which means that even if you go there alone, you don't feel lonely. Refreshingly, children are not just tolerated, it is expected that they need to run off steam and make a lot of noise and it is wonderful to be able to enjoy a cup of tea without worrying that your little darlings are too hyperactive for those without children attempting a quiet lunch. They also run regular activities. At £5 they may seem a bit pricey at first glance, but included in that is a glass of squash and one of the aforementioned yummy cupcakes - a bargain when many of the classes offered usually charge £5 alone at other venues. I haven't had the opportunity to try out many of the classes, but they include baby signing, dance lessons, story time and craft activities. 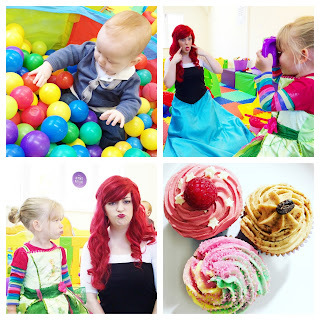 If that isn't enough for you, Saturdays are themed activity days and you're likely to encounter another local business, Fairydust Entertainment who often arrange for their princesses and fairies to attend. This goes down particularly well with Lily who is convinced that Anna, Elsa and Tinkerbell are good friends of hers. In fact, she loves them so much that's a whole other post! So, the next time you're in High Wycombe with children desperate to run off steam after a busy morning shopping, I definitely recommend a trip to Lilymae's Play Cafe. More details and opening times can be found at www.lilymaesplaycafe.co.uk. Linking up with Family Fever and Going on an adventure for #TriedTested. Oh what a great idea! I need somewhere like this down the road from me please!